IEC 62246-1-1:2018 is a blank detail specification which defines requirements and tests for reed switches for use in general and industrial applications. This document is intended to be used in conjunction with IEC 62246-1:2015 and specific products standards applying as switching elements. This document selects from IEC 62246-1:2015 and from other sources the appropriate test procedures to be used in detail specifications derived from this specification. Reed switch types are specified depending on characteristic values including functional ratings for safety and tests. This second edition cancels and replaces the first edition published in 2013. This edition constitutes a technical revision. 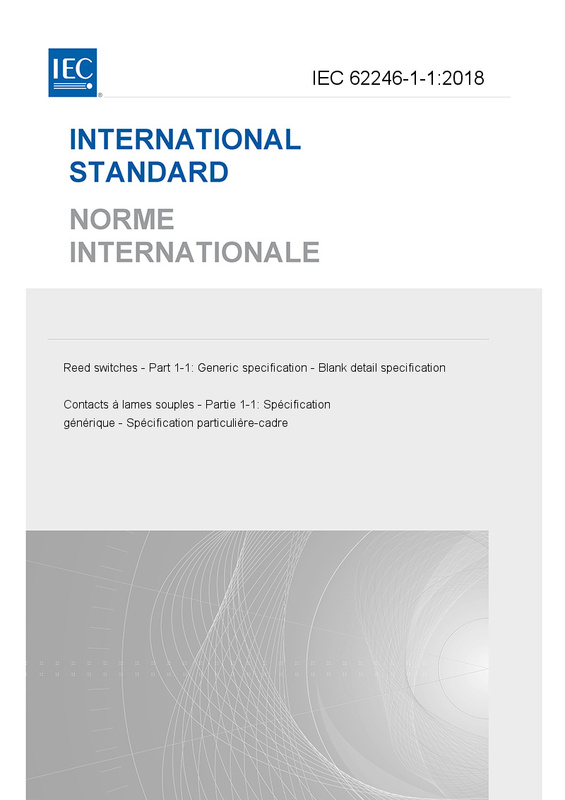 This edition includes the following significant technical changes with respect to the previous editions: a) update of the scope, references and terms and definitions; b) inclusion of guidelines for the preparation of blank detail and detail specifications; c) update of characteristics values including functional ratings for safety; d) update of the quality conformance inspection procedures; e) update of typical applications.